Introducing the new educational DVD from award-winning drummer, author and educator Daniel Glass. This 2-disc package offers a sweeping look at 100 years of music evolution, covering the end of the Civil War (1865) to the dawn of the British Invasion (1965). The goal? To show musicians and music students here in the 21st Century just how much they have in common with the past. Ragtime to Rock takes the viewer on a thrilling journey that details how American Popular Music evolved alongside important historical, economic and sociological events such as Slavery, Segregation, Prohibition, Immigration, the Great Depression, World War II, the rise of the teenager, and many more. To bring this fascinating story to life, Ragtime to Rock incorporates eight high-energy performances from an all-star band featuring members of Royal Crown Revue, the Brian Setzer Orchestra, the Michael Buble band, Conan O’Brien’s house hand, and Bette Midler’s “Kiss My Brass” Revue. In addition to a 100+ minute video, this package includes a 69-page eBook that contains reproducible sets of Teacher/Student Guides and Activity Sheets. Whether you teach General Music, Jazz Studies, band, choir or private instrumental instruction, you’ll find that the high-energy, info-packed presentation of Ragtime to Rock will offer your students a deeper connection to the music they listen to today. Simply put, it will make your job easier! Incredibly thorough and engaging! I’m recommending this DVD to my colleagues and students. It should prove to be an invaluable resource to those individuals who would like to enhance their awareness of American popular music. Your video saved my life! I was handed a last-minute General Music class in August… This is how I realized how valuable the teacher resource kit was. This DVD covers all the bases with current educational trends: relevancy, pacing and a multi-disciplinary (aka cross-curricular) approach that meets many core standards. I’ve been teaching an American popular music unit for the last 10 years, and I’ve always wanted a video series that covered all the styles in a concise introductory way. I’ve been pulling together materials but they’ve mostly been geared too young or too advanced. “From Ragtime to Rock” seems just the right fit. – Explores the instrumentation of a pop music ensemble, showing how a horn-based military band eventually transformed into a small combo dominated by rhythm instruments. – Looks at the relationship of vocal and instrumental music, showing how they have shifted in importance over the decades. – Details how the blueprint for the pop music formula we still follow today was established during the British Invasion era of Rock’n’Roll. – 2-Disc package includes a 100-minute video program with special bonus performances, plus a 65-page eBook that contains Teacher Guides and reproducible Student Guides and Activity Sheets. The From Ragtime to Rock educator guide has been updated to an in-depth 69–page eBook. You can view and download samples at right. NOTE: If you have purchased an older version of the DVD that has incomplete teacher/student guides, please contact Daniel to receive the latest version. 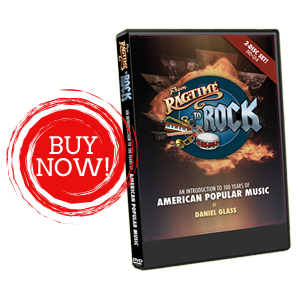 In your email, please include your name, educational institution, and when/where you purchased From Ragtime to Rock. Thanks!